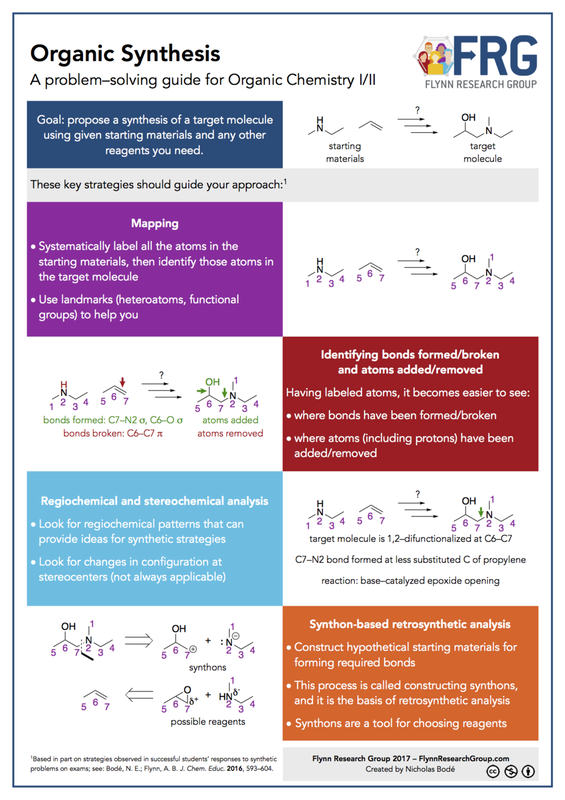 To learn reaction mechanisms in organic chemistry students must understand organic chemistry’s symbolism, make connections between many abstract concepts, and visualize the invisible molecular world. However, the static models that educators use to describe reaction mechanisms poorly represent the dynamic nature of chemistry at the molecular level, where molecules are in constant motion. Animations of organic reaction mechanisms can bring to life the information embedded in these traditional, static representations. The new organic chemistry curriculum at uOttawa and our online learning platform orgchem101.com use Organic ChemWare animations, created using best practices from the visualization literature. We are investigating how these animations affect student learning at the behavioural and neurological level. To do this, we are conducting studies to compare how static and animated representations of organic chemistry reactions are experienced by the students using eye-tracking technology, and also how they affect patterns of brain activity. In particular, we are interested in how resting state brain activity can predispose an individual’s problem solving abilities and capacity for learning. This mix of neuroscience and educational research allows us to investigate complex questions and will help us improve the quality and effectiveness of animations as learning tools for organic chemistry. I teach most courses in a flipped (aka inverted) format. In a flipped course, content that is traditionally delivered in class is moved online, and problem-solving and other learning activities take place in class. For these courses, the lectures are now online and are broken up in short video segments. In-class time is dedicated to problem solving and figuring out more complex topics. Our research found that a flipped classroom format significantly increased students' academic success in the course as well as significantly decreased the withdrawal and failure rates. Flynn, A.B. "Structure And Evaluation Of Flipped Chemistry Courses: Organic & Spectroscopy, Large and Small, First To Third Year, English And French" Chemistry Education: Research and Practice, 2015, 16, 198-211. Carlee Stoyanovich, Aneri Gandhi, & Alison B. Flynn. Acid–Base Learning Outcomes for Students in an Introductory Organic Chemistry Course. J. Chem. Educ. 2015, 92, 220–229. Alison B. Flynn “NMR Interpretation: Getting from Spectrum to Structure” J. Chem. Educ. 2012, 89 (9), 1210-1212. Alison B. Flynn. “A Post-Class Question That Provides Feedback and Connects In- and Out-of-Class Learning” Collected Essays on Teaching and Learning Journal, 2012, 5, 153-160. OrgChem101 is a website that was created to help students learn organic chemistry’s language and provide students with the tools to help them better interpret organic reaction mechanisms as well as improve their metacognitive skill. OrgChem101 is free for anyone to use, and includes three modules: Organic Nomenclature, Organic Mechanisms, and Acid-Base Reactions. The Organic Nomenclature module is a FREE, bilingual, online, interactive learning tool designed to help students learn organic chemistry nomenclature. With this learning tool, students can draw organic molecules, name organic molecules, and identify key functional groups. There are hints to guide students along the way. Best of all, we describe the relevance of these molecules in our everyday lives! Here’s an article about the project written by Tyler Irving for the Canadian Chemical News (January 2012 issue): ACCN article.pdf and a more recent one: Organic chemistry students get online support for knowledge gap. ACCN, July/Aug 2014 issue, page 42. The purpose of the Organic Reaction Mechanisms module is to provide students with an online interactive resource in learning organic chemistry concepts. Currently, eye-tracking studies are working to investigate students' experiences using OrgChem101. Visser, R. Flynn, A. (2018). Developing Open Educational Resources in French and English for Students of Organic Chemistry at the University of Ottawa, Canada. Retrieved from https://teachonline.ca/pockets-innovation/developing-open-educational-resources-french-and-english-students-organic-chemistry-university on July 16th. Bodé, N. E., Caron, J., & Flynn, A. B. (2016). Evaluating students’ learning gains and experiences from using nomenclature101.com. Chem. Educ. Res. Prac., 17(4), 1156–1173. This project is through a collaboration with the Centre for eLearning—part of uOttawa’s Teaching and Learning Support Service—and senior undergraduate student Melissa Daviau-Duguay. Our posters from the Canadian Network for Innovation in Education conference (Chem_Poster_CNIE FINAL.pdf) and the International Conference in Chemical Education (Nomenclature101_Poster_ICCE.pdf) explain more. We developed a new organic curriculum at uOttawa that we have been teaching since 2011. We reorganized the reactions we teach so that they are organized by their governing mechanism. The goal is to help students identify and predict patterns and principles of reactivity rather than memorize. The organic chemistry curriculum at the University of Ottawa has been redesigned to incorporate a patterns-of-mechanisms model in place of a functional group one. The curriculum emphasizes mechanistic patterns and chemistry principles and is organized in a gradient of difficulty. Flynn, A. B.; Ogilvie, W. W. “Mechanisms before reactions: A mechanistic approach to the organic chemistry curriculum based on patterns of electron flow” J. Chem. Educ. 2015, 92(5), 803–810. We are studying student learning in the context of the new curriculum. One series of studies looks at how participants (from novices to experts) organize organic chemistry reactions and why—an aspect of chemistry knowledge organization. Galloway, K. R.; Leung, M. W.; & Flynn, A. B. “A comparison of how undergraduates, graduate students, and professors organize organic chemistry reactions” J. Chem. Educ. 2018, 95(3), 355–365. DOI: 10.1021/acs.jchemed.7b00743. There are currently two projects related to the evaluation of the patterns of mechanisms curriculum at uOttawa. One project is studying how students interpret and use the language of mechanisms having learned the symbolism, but before learning specific reactions. The second project is investigating how students organize their knowledge of organic reactions. The organic chemistry curriculum at uOttawa is taught based on the governing pattern of mechanism. One of the goals of this organization is to help students to be able to make connections between reactions with different structural features but similar mechanisms. If students are able to identify mechanistic patterns between reactions, then the need for memorizing individual reactions is reduced. Although the curriculum is organized by pattern of mechanism, we need to collect evidence for how students are perceiving (or not) connections between organic reactions. We have developed a card sort task to explore how students are organizing their knowledge of organic reactions. The results from this study will provide evidence for how to design instruction to help students be able to identify mechanistic patterns across organic reactions. Students studying organic chemistry must learn to understand the macroscopic and submicroscopic levels of chemistry, both of which are communicated through a third symbolic level comprised of symbols and representations, which is organic chemistry’s language. More specifically, organic chemists use curved arrows as a form of symbolism to analyze and explain electron movement at a molecular level. The SSHRC study employs eye-tracking methods to investigate how students and experts “read” organic chemistry’s language. Additionally, since the new curriculum at the University of Ottawa explicitly teaches organic chemistry’s language before concepts and reactions, this study aims to investigate, through eye-tracking, the effect on cognitive load of learning chemistry’s language before concepts. The SSHRC study also aims to investigate, through interviews, how students categorize organic reaction mechanisms by considering how they choose to associate new information with existing knowledge. The results from the SSHRC study will provide insight into how explicitly learning organic chemistry’s language affects students’ attention, cognitive load, and meaningful learning. Galloway, K. R.; Stoyanovich, C.; Flynn, A. B. "Students’ interpretations of mechanistic language in organic chemistry before learning reactions" Chem. Educ. Res. Pract. 2017, 18, 353. Flynn, A. B.; Featherstone, R. B. "Language of mechanisms: exam analysis reveals students' strengths, strategies, and errors when using the electron-pushing formalism (curved arrows) in new reactions" Chem. Educ. Res. Pract. 2017, 18, 64. The cognitive domain of Bloom’s taxonomy (describes six orders of learning in the form of a pyramid, in which remembering is at the bottom and creating (something new) is at the top. The higher orders of learning require advanced skills such as analysis and problem-solving, as well as incorporating the lower level skills. Retrosynthetic analysis and synthesis require higher order thinking skills and constitute challenges in learning. We are studying how chemistry students learn those higher order skills and the effectiveness of in- and out-of-class teaching & learning activities. One main goal is to help students improve their higher order thinking skills through those targeted learning activities. Flynn, A. B. “Developing Problem-Solving Skills through Retrosynthetic Analysis and Clickers in Organic Chemistry” J. Chem. Educ., 2011, 88 (11), 1496–1500. Flynn, A. B. “How do students work through organic synthesis learning activities?” Chem. Educ. Res. Prac. 2014, 15, 747–762. Bodé, N. E.; Flynn, A. B. “Strategies of Successful Synthesis Solutions: Mapping, Mechanisms, and More” J. Chem. Educ., 2016, 93 (4), 593–604. An ACS Editor’s Choice article.